The Life Fitness treadmill T5 Track Connect is the optimal training equipment for ambitious runners and fitness enthusiasts attaching great importance to high-quality workouts. The clear Track Connect console combines the best of entertainment and motivation. A multitude of workout programmes makes an individual training possible, while you are accompanied by your favourite music or watch a film. The Life Fitness treadmill T3 with Go console is ideal for intensive workouts at home thanks to its durable construction and versatile equipment. The running surface is very big (153 x 51 cm) and offers enough space even for high speeds. The Life Fitness treadmill T3 with Go console is equipped with a 3 HP motor offering speeds up to 20 km/h. The incline is variable between 0 and 15 %. 13 programs (5 of them pulse controlled) make exercising with the Life Fitness treadmill T3 varied. Heart rate can be measured by hand pulse sensors or provided chest strap. The FlexDeck® shock absorption system of the Life Fitness T3 provides a comfortable feeling and reduces the kick while running up to 30 %. The Life Fitness treadmill T3 with Go console is equipped with a steel frame construction which is loadable up to 159 kg. The Life Fitness treadmill T5 Go is a home equipment for ambitious runners and fitness enthusiasts, attaching great importance to a high-quality workout with customized functions and a clear user surface. 13 different programs, different adjustments of degrees of hardness, and a great comfort are offered by the treadmill - all conditions for an effective fitness programs. The Treadmill Life Fitness F1 Smart Folding combines the experience for many years of Life Fitness regarding construction of high-quality fitness equipment with the use of modern, innovative technologies. Therefore, the foldable Treadmill Life Fitness F1 Smart Folding is a robust treadmill with varied equipment for your personal workout: The efficient shock absorption system of the F1 treadmill is very joint-gentle during the running workout. Furthermore, you can optimize your workout by means of the Virtual Training Website of Life Fitness - according to your aims. 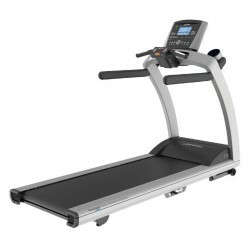 The Life Fitness Platinum Club Series Discover SE3 treadmill WIFI sets standards for cardio fitness: a highly durable construction and a 4 HP strong AC motor are the high-quality basis of this special treadmill. In addition to the powerful and durable mechanics, the Life Fitness Platinum Club Series Discover SE3 treadmill WIFI offers most modern entertainment of impressive HD quality. Either Internet, TV or interactive virtual training courses: the Life Fitness Platinum Club Series Discover SE3 treadmill WIFI provides entertainment, tension, and fun to exercise. In addition, the Life Fitness Platinum Club Series Discover SE3 treadmill WIFI offers innovative extras: a customizable starting screen with scrolling text, analysis tools for analysing the equipment use, and many other features make the Life Fitness Platinum Club Series Discover SE3 treadmill WIFI a real highlight among cardio equipment. Space-saving, modern, sturdy - the Life Fitness treadmill F3 with Go console convinces by many features. 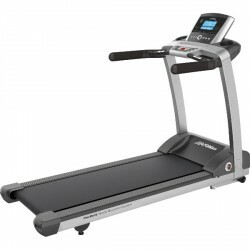 The strong 3 HP motor accelerates the Life Fitness treadmill up to 16 km/h, the incline is variable between 0 and 12 %. The F3 with Go console is equipped with 13 programs for a varied workout. 5 of them are pulse controlled, heart rate can be measured by integrated hand pulse sensors of the Life Fitness treadmill F3 or a provided chest strap. The running mat offers enough space with 140 x 51 cm and guarantees a joint-gentle workout thanks to the FlexDeck® shock absorption system. The durable Life Fitness treadmill F3 with Go console is equipped with a solid steel frame and can be loaded up to 159 kg. Use the practical folding mechanism to store the Life Fitness treadmill F3 in a space-saving way after the workout. The Life Fitness Platinum Club Series Discover SI treadmill WIFI is the optimal treadmill of gym quality for the advanced sport at home. 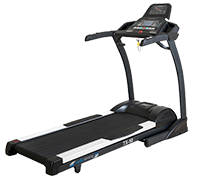 Besides an enormous durability and excellent absorption - well-known features of Life Fitness - the Life Fitness Platinum Club Series Discover SI treadmill WIFI offers most modern enterntainment of a quality never seen before. Valuable additional functions like a customizable start screen with scrolling text function, analysis tools for analysing the equipment use, and several extras make the Life Fitness Platinum Club Series Discover SI treadmill WIFI an absolute highlight among cardio machines. Combine movement and productivity at the office with the Life Fitness InMovement desk treadmill! The desktop treadmill convinces absolutely. It combines the LifeFitness-Knowhow regarding quality and biomechanics with the InMovement concept of the productive well-being, which aims at integrating physical movement in to the everyday life at work. 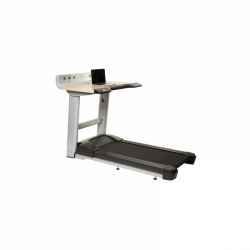 Being equipped with the LifeFitness FlexDeck Shock Absorption System, a quiet motor, a height-adjustable working surface, a well-thought out connection panel, and the integrated cable management, you get a sustainable, innovative treadmill desk. It is perfectly integrable in every office and is ideal for home office as well! Purchase the Life Fitness T3 - an excellently equipped treadmill of durable construction. The Life Fitness treadmill T3 with Track Connect console can be loaded up to 159 kg and accelerates with its 3 HP motors up to 20 km/h. Incline is adjustable between 0 and 15%. 14 programmes, five of them pulse controlled, guarantee diversion while exercising with the Life Fitness treadmill T3. Heart rate is measured by hand pulse sensors or the provided chest strap. The Life Fitness treadmill T3 with Track Connect console offers comfort as well. The running surface of 153 x 51 cm offers enough space and the FlexDeck® shock absorption system provides a joint-gentle workout. Compared to the Go version, the Life Fitness treadmill T3 with Track Connect console is equipped with an iPod® connection and a USB interface. This offers the connection to the Virtual-Trainer website of Life Fitness for analysing and planning your workout. 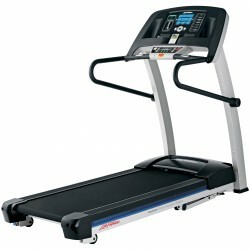 Like all fitness machines of Life Fitness, Life Fitness treadmills convince by a high quality and versatile functions. The treadmills of Life Fitness guarantee an intensive, comfortable, and entertaining training at home. 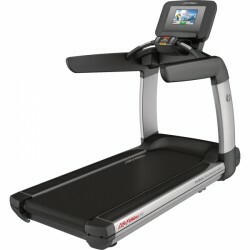 All Life Fitness treadmills offer a heart-rate controlled home training. Thus, the Life Fitness treadmill of high value are ideal for all those, who want to strengthen their cardiovascular system or wish to lose weight. 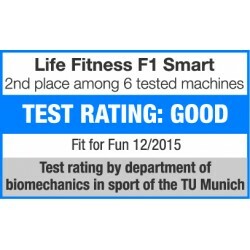 The treadmills F1 Smart Folding and F3 present the Life Fitness F series. The highlight of those treadmills is the hydraulic folding mechanism. Thanks to the practical folding system, the sturdy treadmills are easily and space-efficiently folded. Due to the joint-gentle FlexDeck absorption system, Life Fitness treadmills of the F series inspire by their running features. The perfect FlexDeck shock absorption system allows a maximum running comfort. Thanks to the outstanding absorption, treadmills are ideal for every body type. While the treadmill F1 Smart Folding is equipped with a 2.5 HP motor, the F3 convinces by its 3 HP strong motor. The F1 Smart Folding is an optimal training partner for beginners and the F3 is recommendable for ambitious runners. Both models allow a maximum speed of 16 km/h and incline is adjustable between 0 to 12%. The console is another distinctive feature. The F1 Smart Folding is equipped with an intuitively operated F1 console, which provides training data like pulse, distance, calory consumption, and speed directly. In addition, the F1 console offers six varied training programs and a heart-rate controlled program. The chest strap for telemetric heart rate measuring is already included in delivery. The USB connection for more programs via the Life Fitness Virtual Trainer website and the docking station for charging your iPhones and for playing via the integrated loudspeakers complete the good equipment of the F1 Smart Folding. The treadmill F3 offers the Go or the Track+ console. Compared to the F1 console, the Go and Track+ consoles provide more training programs: the Go console has 13, the Track+ 14 training programs, of it five heart rate controlled. While the Go console offers an essential functionality, the Track+ console provides an entertaining and motivating workout due to its wide-range entertainment features. The treadmills of the F series are equipped with an energy save mode. The treadmills are environmentally friendly and switch to the rest mode having not been used after five minutes. The energy consumption is reduced by up to 90 %. 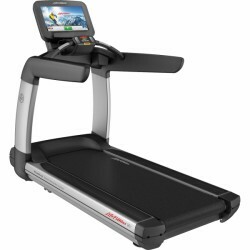 The Life Fitness T series treadmill includes two sturdy treadmills: T5 and T3. Both models concinve by the first-class Life Fitness quality, sturdy frame build, and wide-range entertainment and program features. The treadmills T5 and T3 are equipped with a 3 HP strong motor, allowing speeds of 0.8 to 19 km/h. In addition, incline can be set from 0 to 15%. Demanding hill runs can be simulated. Thanks to the powerful motors, the treadmills T3 and T5 are interesting for ambitious sportsmen. The patented FlexDeck shock absorption system ensures a very comfortable running on the T3. The absorption system convinces by its good running features and reduces the stress on the joints. 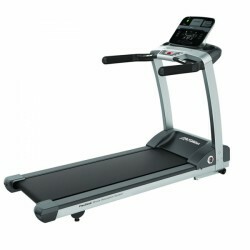 The treadmill T5 is equipped with the newly developped FlexDeck Select shock absorption system. This improved system allows the adjustment of the degree of hardness: standard, stable, and hard. Create and choose your running tracks individually - either simulating your running training on gras, asphalt or a tartan track. The treadmills T3 and T5 are available with the Go and Track+ consoles. 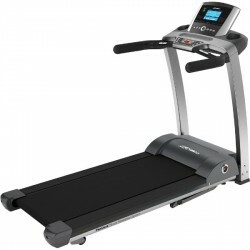 The treadmills of the Club Series and the Platinum Club Series Discover complete the Life Fitness range of treadmills. The treadmills of the Life Fitness Club Series and Platinum Club Series Discover are especially designed for intensive use. They convince by a highly loadable frame build and a 4 HP powerful AC motor. The patented FlexDeck absorption system guarantees an excellent running experience and is joint-gentle. Due to a big running surface, the treadmills offer a maximum comfort and freedom to move. The Club Series treadmill can be accelerated to a speed of up to 19.3 km/h. The Platinum Club Series Discover offers a maximum speed of up to 23 km/h. The Club Series treadmill is equipped with the Club Series console, which offers the same entertainment and program features like the Life Fitness top commercial model. The Club Series treadmill presents 16 training programs, of it five customized and five heart-rate controlled. In addition, the console is equipped with an iPod docking station, which allows varied entertainment and charging your iPhones. 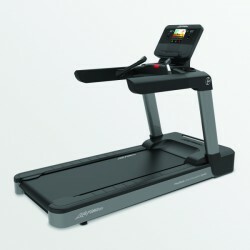 The highlight of the Platinum Club Serie Discover treadmills are the revolutionary Platinum Discover SE and SI consoles. The SE and SI consolen offer even more training programs (all in all 33, of it eight heart rate controlled) compared to the Club Series. While the Platinum Discover SE console surprises with a 19 inches touchscreen display with integrated tv, the SI console is equipped with a 10 inches touchscreen dislay.